Bulk handled quality. Many show evidence of multiple striking. Since these are broad-struck over existing coins, the original edge lettering will show, and the diameter varies (usually slightly larger). 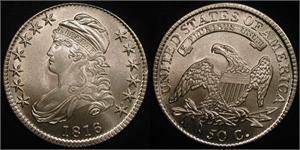 Die Pair 1 with "1816/5" overdate and "50 C." over "5C C.". Due to a fire in the rolling mill room at the US Philadelphia Mint in 1815, no silver or gold coins were struck in 1816.